Pyeongchang 2018: What’s on the Menu? Brighter Green’s blog recently covered food and sustainability concerns at the London Olympics. Given the role of meat production in contributing to climate change and its global threat on the environment and public health, future host cities might want to rethink what is an appropriate meal for the world’s stage. I had written before about animal agriculture issues in Korea including national beef campaigns in response to the Korea U.S. Free Trade Agreement. 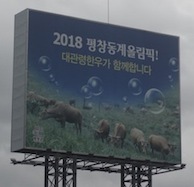 In addition, two years ago, farms across the country, including some not too far from Pyeongchang were hit hard by foot and mouth disease and avian flu. In the course of a few months, over 3 million pigs were killed across the country in 2010. With rising temperatures and erratic weather patterns, the choice between tofu and beef perhaps is not just one to consider for future world games but for our future world.